By CandidCupcake on June 5th, 2011 . Filed under: Announcements, Bakeries, Celebrities, Photos . 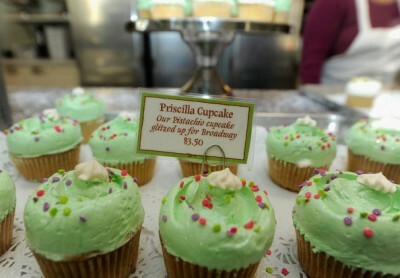 New York City’s Magnolia Bakery will once again release the “Priscilla Cupcake” on Monday, June 6. This green pistachio cupcake, iced with pistachio meringue butter-cream icing and topped with a meringue kiss and colorful confetti, was inspired by the dancing cupcakes from the Broadway musical Priscilla Queen of the Desert. 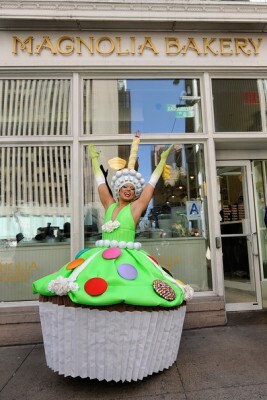 Actor Thom Allison celebrates the unveiling of the "Priscilla Cupcake"
The original debut of the “Priscilla Cupcake” in March was a monumental occasion for this cozy Greenwich Village bakery. It marked the first time in their history that a Broadway musical was the inspiration for one of these sweet treats. If you want a taste, you better hurry! They will only be available through Sunday, June 12.